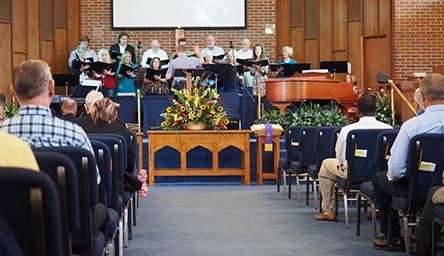 Our worship services include varied styles of music including contemporary songs as well as the more traditional hymns, teen through senior adult choir members, string, guitar and percussion orchestra, and piano. We combine a variety of sound and expression based on a Biblical message. 'For He Alone is Worthy' and that is a primary reason we gather together as a church family. The difficulties we face in life can be challenging, but not impossible. Our goal at FBCH is to help you navigate these storms of life successfully. We are committed to providing you and your family an atmosphere that will help you weather these storms in a biblical way. We rehearse on Sunday afternoons at 5:30.